This blog entry is adapted from a lecture, “Happy 100th Birthday Wristwatch” that I presented at the NAWCC 2016 Mid-Winter Regional in Lakeland, Fla., on Feb. 13. The lecture was not video recorded, and there were only about 12 people in attendance. So I am publishing it here in three parts to give it a little wider exposure. I hope you enjoy it. The 100th anniversary of the trench watch (the archetype of modern man’s wristwatch in my opinion) is right around the corner in 2017, and I thought I would give my readers a little “heads up” notice. Why? Because I think the value of these early wristwatches is going to jump in the next year in conjunction with the 100th anniversary of World War I. It wouldn’t be the worst idea in the world to pick up a few of these watches before prices increase. The media will no doubt hype the war’s centennial anniversary and cover all facets of it, including wristwatches. All it will take is for Brad Pitt or Christian Bale or some other big star to wear a period watch in some blockbuster movie, and thousands of movie fans will suddenly want a trench watch! Meanwhile, the glossy watch magazines will be all be all over this significant anniversary, and I have little doubt that watch companies will come out with reproductions, which will only increase the value of actual trench watches. Now I know what many of you are already thinking: The man’s wristwatch is already a good century old and then some. And you’d be correct. Many of us have heard the stories of wristwatches being used by soldiers in the Boer war (1899-ish), and seen pictures of British infantry units wearing wrist-type watches (some going as far back as 1879). Officer in middle of front row is clearly wearing some type of watch strapped to his wrist. 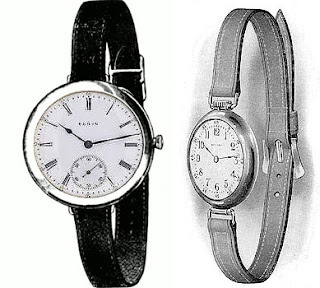 And we know that Elgin introduced its first fully finished man's wristwatch in 1911, with Waltham following in 1912. 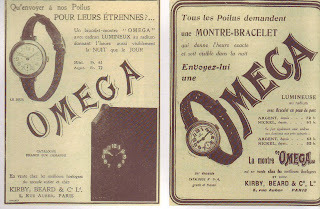 We also know that Europe was a few years ahead of America in introducing finished watches to the public, notably Omega and Longines, in the 1905 -- 1910 area. So I am ready to concede that men’s wristwatches appeared before 1917. But I would argue that wristwatches for men up to that point were little more than a novelty … specialty items for tennis, sporting, motoring, or technical applications. They were fragile; some even called them “toys.” And, most of all, wristwatches were considered feminine. Few self-respecting gentlemen of the day would be caught dead wearing one as an everyday timepiece. In fact Hamilton, which by that time had established itself as the timekeeper of railroad accuracy, steadfastly refused to even offer such a watch for sale. All of that that changed in 1917. It is no small coincidence that this anniversary also coincides with the year in which America entered the war, and what had been called the “War in Europe” was now World War I. As is the case so often, war is the catalyst by which public tastes and values change, and technology advances or at the very least shifts in some way. Think about most any invention – from M&Ms and microwave ovens, to global positioning systems and antibiotics, and you can trace their roots to the military. But I digress. 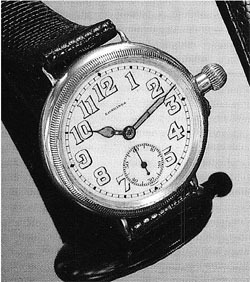 It was the outbreak of World War I that brought the wristwatch out of obscurity and into the mainstream. This is certainly well known among watch historians. But I don’t think it’s ever been well documented just how quickly and dramatically the man’s wristwatch changed in just two short years, from 1917 to 1919, to become more masculine looking and indeed the archetype for the basic man’s wristwatch that we know today, 100 years later. So let’s take a closer look. First of all, how did the necessity for a wristwatch come about? The war in Europe had been raging since 1914. Many of the techniques and hardware of traditional warfare up to that time had proven ineffective in this new form of trench warfare. This was the first mechanized war in which motorized vehicles – tanks, troop carriers, and ambulances -- replaced horses and wagons. Long rifles proved cumbersome in tight quarters. And perhaps for the first time, it was necessary for coordinated movement of troops that might be scattered along a zig-zag trench or isolated from one another. It would be completely inefficient and unwieldy for a soldier to reach into a pocket for a watch. The time had come for a wristwatch suited to the trenches, and the American military needed thousands and thousands of them … and quickly. Several components had to come to together to make this new "trench watch," and we’ll look at those components in the next installment. Resources: My good friend and fellow historian, Stan Czubernat, has recently published his second book on Waltham WWI trench watches to compliment his first book on Elgin trench watches of the Great War. Together, these two volumes comprise a wealth of information about trench watches. The books are "must-haves" if you are thinking of collecting these great old watches. Click on the image below to obtain ordering info, and also have a look at the watches Stan has for sale. It is with regret that I announce I am no longer writing the the "Wristwatches" column for the Watch & Clock Bulletin, the bimonthly journal of the National Association of Watch & Clock Collectors. It has been a great run for the past 19 years. But under new editorial leadership, the publication has adopted new policies and procedures with which I do not agree. I hope you continue to enjoy my work in this and other venues.